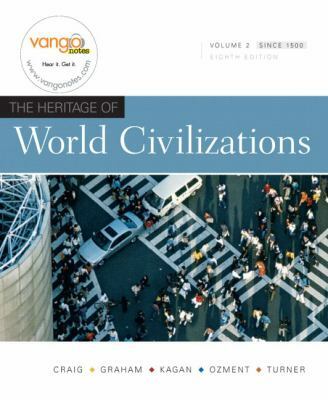 The Heritage of World Civilizations, Eighth Edition is available in the following formats: Combined Volume (hardback) Chapters 1-34 0-13-601905-6 Volume 1: To 1700 (paperback) Chapters 1-18 0-13-600277-3 Volume 2: Since 1500 (paperback) Chapters 15-34 0-13-600322-2 About the Cover Dyers'Vats and Workshops in Fez, Morocco Founded in the ninth century CE and home to the oldest university in the world, the city of Fez was Morocco's capital in the thirteenth and fourteenth centuries. The buildings and monuments of the medina(market), a UNESCO World Heritage site since 1981, date from this period. The dyers'district of Fez has hardly changed since those days, and the same traditional coloring techniques have been used for centuries. Tanned hides and textiles are submerged in dye vats and are trodden down by the craftsmen. The coloring is derived from natural pigments, such as poppy, indigo, saffron, and date nuts. The dyed materials are then used to make world-famous carpets and leather objects that form an important part of the Moroccan economy. Some of the processes used are harmful to both the environment and the craftsmen themselves, who work without protective masks.Albert M. Craig is the author of 'Heritage of World Civilizations, The, Volume 2 (8th Edition)', published 2008 under ISBN 9780136003229 and ISBN 0136003222.